Pinterest is pretty great for finding some amazing tips on house keeping, design and even cooking. It’s a virtual swap meet! On Pinterest, I keep several boards about my topics from the blog, my books and things that interest me, which are conducive to showing in pictures. Of course, that includes my Culinary K section. The lovely thing about Pinterest is that I can pin more than my own recipes. I have pinned the recipes I have made by other people and recipes I am interested in making. You’ll see that I have quite the sweet tooth. Being bored with the same dinners night after night can send you to restaurants and into massive weight gain. The last thing I want is to over eat because I’m bored! To help keep slim, I look for simple recipes with a lot of flavor that won’t add pounds. What is better than chicken for dieting, or, really, any time? When I found the recipe below, I was really excited. 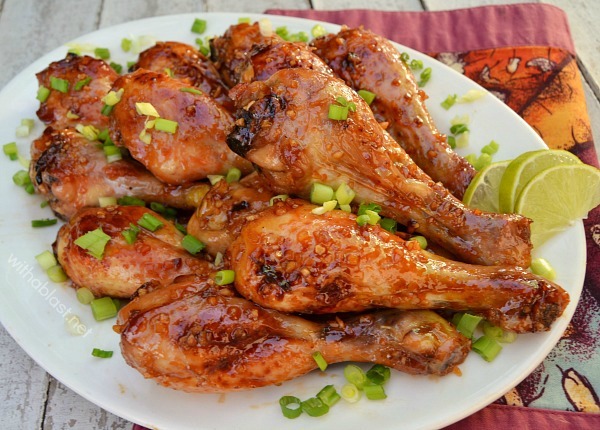 It combined my favorite things: chicken, sriracha, honey and garlic. I mentioned it to a friend and even he had to have this recipe upon hearing it. And, that is the great thing about Pinterest. We can share very easily, and keep these recipes in one neat place accessible via any smart device. I modified the recipe by using chicken thighs, which are close to legs in the type and texture of meat. They came out beautiful! The only thing I still had a question on was Thick Soy Sauce. Where would I get that? I have that answer for you here. You learn something from venturing off the beaten paths. These recipes make it easy. Using regular soy sauce only made the sauce thinner. I basted the thighs with them several times to get a good coat on them. Go ahead and try this! I give it 5 stars.